Not to be confused with Alkene, Alkali, Alkyne, or Alkaline. IUPAC defines alkanes as "acyclic branched or unbranched hydrocarbons having the general formula CnH2n+2, and therefore consisting entirely of hydrogen atoms and saturated carbon atoms". 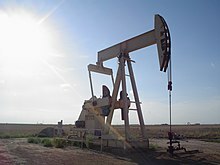 However, some sources use the term to denote any saturated hydrocarbon, including those that are either monocyclic (i.e. the cycloalkanes) or polycyclic, despite their having a different general formula (i.e. cycloalkanes are CnH2n). In an alkane, each carbon atom is sp3-hybridized with 4 sigma bonds (either C–C or C–H), and each hydrogen atom is joined to one of the carbon atoms (in a C–H bond). The longest series of linked carbon atoms in a molecule is known as its carbon skeleton or carbon backbone. The number of carbon atoms may be considered as the size of the alkane. One group of the higher alkanes are waxes, solids at standard ambient temperature and pressure (SATP), for which the number of carbon atoms in the carbon backbone is greater than about 17. With their repeated –CH2 units, the alkanes constitute a homologous series of organic compounds in which the members differ in molecular mass by multiples of 14.03 u (the total mass of each such methylene-bridge unit, which comprises a single carbon atom of mass 12.01 u and two hydrogen atoms of mass ~1.01 u each). Alkanes are not very reactive and have little biological activity. They can be viewed as molecular trees upon which can be hung the more active/reactive functional groups of biological molecules. The alkanes have two main commercial sources: petroleum (crude oil) and natural gas. An alkyl group, generally abbreviated with the symbol R, is a functional group that, like an alkane, consists solely of single-bonded carbon and hydrogen atoms connected acyclically—for example, a methyl or ethyl group. 2n, n > 3) wherein the carbon backbone is linked so as to form a loop. 2n−2k+2, where k is the number of independent loops. Alkanes are the acyclic (loopless) ones, corresponding to k = 0. Different C4 alkanes and cycloalkanes (left to right): n-butane and isobutane are the two C4H10 isomers; cyclobutane and methylcyclopropane are the two C4H8 alkane isomers. Bicyclo[1.1.0]butane is the only C4H6 alkane and has no alkane isomer; tetrahedrane (below) is the only C4H4 alkane and so has no alkane isomer. C60: 22,158,734,535,770,411,074,184 isomers, many of which are not stable. Branched alkanes can be chiral. For example, 3-methylhexane and its higher homologues are chiral due to their stereogenic center at carbon atom number 3. In addition to the alkane isomers, the chain of carbon atoms may form one or more loops. Such compounds are called cycloalkanes. Stereoisomers and cyclic compounds are excluded when calculating the number of isomers above. The IUPAC nomenclature (systematic way of naming compounds) for alkanes is based on identifying hydrocarbon chains. Unbranched, saturated hydrocarbon chains are named systematically with a Greek numerical prefix denoting the number of carbons and the suffix "-ane". In 1866, August Wilhelm von Hofmann suggested systematizing nomenclature by using the whole sequence of vowels a, e, i, o and u to create suffixes -ane, -ene, -ine (or -yne), -one, -une, for the hydrocarbons CnH2n+2, CnH2n, CnH2n−2, CnH2n−4, CnH2n−6. Now, the first three name hydrocarbons with single, double and triple bonds; "-one" represents a ketone; "-ol" represents an alcohol or OH group; "-oxy-" means an ether and refers to oxygen between two carbons, so that methoxymethane is the IUPAC name for dimethyl ether. It is difficult or impossible to find compounds with more than one IUPAC name. This is because shorter chains attached to longer chains are prefixes and the convention includes brackets. Numbers in the name, referring to which carbon a group is attached to, should be as low as possible so that 1- is implied and usually omitted from names of organic compounds with only one side-group. Symmetric compounds will have two ways of arriving at the same name. Straight-chain alkanes are sometimes indicated by the prefix "n-" (for normal) where a non-linear isomer exists. Although this is not strictly necessary, the usage is still common in cases where there is an important difference in properties between the straight-chain and branched-chain isomers, e.g., n-hexane or 2- or 3-methylpentane. Alternative names for this group are: linear paraffins or n-paraffins. The first four names were derived from methanol, ether, propionic acid and butyric acid, respectively (hexadecane is also sometimes referred to as cetane). Alkanes with five or more carbon atoms are named by adding the suffix -ane to the appropriate numerical multiplier prefix with elision of any terminal vowel (-a or -o) from the basic numerical term. Hence, pentane, C5H12; hexane, C6H14; heptane, C7H16; octane, C8H18; etc. The prefix is generally Greek, however alkanes with a carbon atom count ending in nine, for example nonane, use the Latin prefix non-. For a more complete list, see List of alkanes. Simple branched alkanes often have a common name using a prefix to distinguish them from linear alkanes, for example n-pentane, isopentane, and neopentane. IUPAC naming conventions can be used to produce a systematic name. Name each side chain by changing the suffix of the name of the alkane from "-ane" to "-yl"
If there are multiple side chains of the same type, use prefixes such as "di-" and "tri-" to indicate it as such, and number each one. Though technically distinct from the alkanes, this class of hydrocarbons is referred to by some as the "cyclic alkanes." As their description implies, they contain one or more rings. Simple cycloalkanes have a prefix "cyclo-" to distinguish them from alkanes. Cycloalkanes are named as per their acyclic counterparts with respect to the number of carbon atoms in their backbones, e.g., cyclopentane (C5H10) is a cycloalkane with 5 carbon atoms just like pentane (C5H12), but they are joined up in a five-membered ring. In a similar manner, propane and cyclopropane, butane and cyclobutane, etc. Substituted cycloalkanes are named similarly to substituted alkanes — the cycloalkane ring is stated, and the substituents are according to their position on the ring, with the numbering decided by the Cahn–Ingold–Prelog priority rules. The trivial (non-systematic) name for alkanes is 'paraffins'. Together, alkanes are known as the 'paraffin series'. Trivial names for compounds are usually historical artifacts. They were coined before the development of systematic names, and have been retained due to familiar usage in industry. Cycloalkanes are also called naphthenes. It is almost certain that the term 'paraffin' stems from the petrochemical industry. Branched-chain alkanes are called isoparaffins. The use of the term "paraffin" is a general term and often does not distinguish between pure compounds and mixtures of isomers, i.e., compounds of the same chemical formula, e.g., pentane and isopentane. All alkanes are colorless. Alkanes with the lowest molecular weights are gasses, those of intermediate molecular weight are liquids, and the heaviest are waxy solids. Melting (blue) and boiling (orange) points of the first 16 n-alkanes in °C. Alkanes experience intermolecular van der Waals forces. Stronger intermolecular van der Waals forces give rise to greater boiling points of alkanes. Under standard conditions, from CH4 to C4H10 alkanes are gaseous; from C5H12 to C17H36 they are liquids; and after C18H38 they are solids. As the boiling point of alkanes is primarily determined by weight, it should not be a surprise that the boiling point has almost a linear relationship with the size (molecular weight) of the molecule. As a rule of thumb, the boiling point rises 20–30 °C for each carbon added to the chain; this rule applies to other homologous series. A straight-chain alkane will have a boiling point higher than a branched-chain alkane due to the greater surface area in contact, thus the greater van der Waals forces, between adjacent molecules. For example, compare isobutane (2-methylpropane) and n-butane (butane), which boil at −12 and 0 °C, and 2,2-dimethylbutane and 2,3-dimethylbutane which boil at 50 and 58 °C, respectively. For the latter case, two molecules 2,3-dimethylbutane can "lock" into each other better than the cross-shaped 2,2-dimethylbutane, hence the greater van der Waals forces. On the other hand, cycloalkanes tend to have higher boiling points than their linear counterparts due to the locked conformations of the molecules, which give a plane of intermolecular contact. The melting points of the alkanes follow a similar trend to boiling points for the same reason as outlined above. That is, (all other things being equal) the larger the molecule the higher the melting point. There is one significant difference between boiling points and melting points. Solids have more rigid and fixed structure than liquids. This rigid structure requires energy to break down. Thus the better put together solid structures will require more energy to break apart. For alkanes, this can be seen from the graph above (i.e., the blue line). The odd-numbered alkanes have a lower trend in melting points than even numbered alkanes. This is because even numbered alkanes pack well in the solid phase, forming a well-organized structure, which requires more energy to break apart. The odd-numbered alkanes pack less well and so the "looser" organized solid packing structure requires less energy to break apart. The melting points of branched-chain alkanes can be either higher or lower than those of the corresponding straight-chain alkanes, again depending on the ability of the alkane in question to pack well in the solid phase: This is particularly true for isoalkanes (2-methyl isomers), which often have melting points higher than those of the linear analogues. Alkanes do not conduct electricity in any way, nor are they substantially polarized by an electric field. For this reason, they do not form hydrogen bonds and are insoluble in polar solvents such as water. Since the hydrogen bonds between individual water molecules are aligned away from an alkane molecule, the coexistence of an alkane and water leads to an increase in molecular order (a reduction in entropy). As there is no significant bonding between water molecules and alkane molecules, the second law of thermodynamics suggests that this reduction in entropy should be minimized by minimizing the contact between alkane and water: Alkanes are said to be hydrophobic in that they repel water. Their solubility in nonpolar solvents is relatively good, a property that is called lipophilicity. Different alkanes are, for example, miscible in all proportions among themselves. The density of the alkanes usually increases with the number of carbon atoms but remains less than that of water. Hence, alkanes form the upper layer in an alkane–water mixture. The molecular structure of the alkanes directly affects their physical and chemical characteristics. It is derived from the electron configuration of carbon, which has four valence electrons. The carbon atoms in alkanes are always sp3-hybridized, that is to say that the valence electrons are said to be in four equivalent orbitals derived from the combination of the 2s orbital and the three 2p orbitals. These orbitals, which have identical energies, are arranged spatially in the form of a tetrahedron, the angle of cos−1(−1/3) ≈ 109.47° between them. An alkane molecule has only C–H and C–C single bonds. The former result from the overlap of an sp3 orbital of carbon with the 1s orbital of a hydrogen; the latter by the overlap of two sp3 orbitals on different carbon atoms. The bond lengths amount to 1.09 × 10−10 m for a C–H bond and 1.54 × 10−10 m for a C–C bond. The tetrahedral structure of methane. The spatial arrangement of the bonds is similar to that of the four sp3 orbitals—they are tetrahedrally arranged, with an angle of 109.47° between them. Structural formulae that represent the bonds as being at right angles to one another, while both common and useful, do not correspond with the reality. The structural formula and the bond angles are not usually sufficient to completely describe the geometry of a molecule. There is a further degree of freedom for each carbon–carbon bond: the torsion angle between the atoms or groups bound to the atoms at each end of the bond. The spatial arrangement described by the torsion angles of the molecule is known as its conformation. Newman projections of the two conformations of ethane: eclipsed on the left, staggered on the right. Ethane forms the simplest case for studying the conformation of alkanes, as there is only one C–C bond. If one looks down the axis of the C–C bond, one will see the so-called Newman projection. 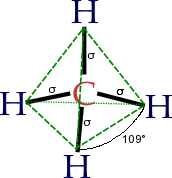 The hydrogen atoms on both the front and rear carbon atoms have an angle of 120° between them, resulting from the projection of the base of the tetrahedron onto a flat plane. However, the torsion angle between a given hydrogen atom attached to the front carbon and a given hydrogen atom attached to the rear carbon can vary freely between 0° and 360°. This is a consequence of the free rotation about a carbon–carbon single bond. Despite this apparent freedom, only two limiting conformations are important: eclipsed conformation and staggered conformation. The two conformations, also known as rotamers, differ in energy: The staggered conformation is 12.6 kJ/mol lower in energy (more stable) than the eclipsed conformation (the least stable). This difference in energy between the two conformations, known as the torsion energy, is low compared to the thermal energy of an ethane molecule at ambient temperature. There is constant rotation about the C–C bond. The time taken for an ethane molecule to pass from one staggered conformation to the next, equivalent to the rotation of one CH3 group by 120° relative to the other, is of the order of 10−11 seconds. The case of higher alkanes is more complex but based on similar principles, with the antiperiplanar conformation always being the most favored around each carbon–carbon bond. For this reason, alkanes are usually shown in a zigzag arrangement in diagrams or in models. The actual structure will always differ somewhat from these idealized forms, as the differences in energy between the conformations are small compared to the thermal energy of the molecules: Alkane molecules have no fixed structural form, whatever the models may suggest. Virtually all organic compounds contain carbon–carbon, and carbon–hydrogen bonds, and so show some of the features of alkanes in their spectra. Alkanes are notable for having no other groups, and therefore for the absence of other characteristic spectroscopic features of a different functional group like –OH, –CHO, –COOH etc. The carbon–hydrogen stretching mode gives a strong absorption between 2850 and 2960 cm−1, while the carbon–carbon stretching mode absorbs between 800 and 1300 cm−1. The carbon–hydrogen bending modes depend on the nature of the group: methyl groups show bands at 1450 cm−1 and 1375 cm−1, while methylene groups show bands at 1465 cm−1 and 1450 cm−1. Carbon chains with more than four carbon atoms show a weak absorption at around 725 cm−1. The proton resonances of alkanes are usually found at δH = 0.5–1.5. The carbon-13 resonances depend on the number of hydrogen atoms attached to the carbon: δC = 8–30 (primary, methyl, –CH3), 15–55 (secondary, methylene, –CH2–), 20–60 (tertiary, methyne, C–H) and quaternary. The carbon-13 resonance of quaternary carbon atoms is characteristically weak, due to the lack of nuclear Overhauser effect and the long relaxation time, and can be missed in weak samples, or samples that have not been run for a sufficiently long time. Alkanes have a high ionization energy, and the molecular ion is usually weak. The fragmentation pattern can be difficult to interpret, but, in the case of branched chain alkanes, the carbon chain is preferentially cleaved at tertiary or quaternary carbons due to the relative stability of the resulting free radicals. The fragment resulting from the loss of a single methyl group (M − 15) is often absent, and other fragments are often spaced by intervals of fourteen mass units, corresponding to sequential loss of CH2 groups. Alkanes are only weakly reactive with ionic and other polar substances. The acid dissociation constant (pKa) values of all alkanes are above 60, hence they are practically inert to acids and bases (see: carbon acids). This inertness is the source of the term paraffins (with the meaning here of "lacking affinity"). In crude oil the alkane molecules have remained chemically unchanged for millions of years. However redox reactions of alkanes, in particular with oxygen and the halogens, are possible as the carbon atoms are in a strongly reduced condition; in the case of methane, the lowest possible oxidation state for carbon (−4) is reached. Reaction with oxygen (if present in sufficient quantity to satisfy the reaction stoichiometry) leads to combustion without any smoke, producing carbon dioxide and water. Free radical halogenation reactions occur with halogens, leading to the production of haloalkanes. In addition, alkanes have been shown to interact with, and bind to, certain transition metal complexes in C–H bond activation. Free radicals, molecules with unpaired electrons, play a large role in most reactions of alkanes, such as cracking and reformation where long-chain alkanes are converted into shorter-chain alkanes and straight-chain alkanes into branched-chain isomers. In highly branched alkanes, the bond angle may differ significantly from the optimal value (109.5°) in order to allow the different groups sufficient space. This causes a tension in the molecule, known as steric hindrance, and can substantially increase the reactivity. See the alkane heat of formation table for detailed data. The standard enthalpy change of combustion, ΔcH⊖, for alkanes increases by about 650 kJ/mol per CH2 group. Branched-chain alkanes have lower values of ΔcH⊖ than straight-chain alkanes of the same number of carbon atoms, and so can be seen to be somewhat more stable. Alkanes react with halogens in a so-called free radical halogenation reaction. The hydrogen atoms of the alkane are progressively replaced by halogen atoms. Free radicals are the reactive species that participate in the reaction, which usually leads to a mixture of products. The reaction is highly exothermic, and can lead to an explosion. Initiation the halogen radicals form by homolysis. Usually, energy in the form of heat or light is required. Chain reaction or Propagation then takes place—the halogen radical abstracts a hydrogen from the alkane to give an alkyl radical. This reacts further. Chain termination where the radicals recombine. Cracking breaks larger molecules into smaller ones. This can be done with a thermal or catalytic method. The thermal cracking process follows a homolytic mechanism with formation of free-radicals. The catalytic cracking process involves the presence of acid catalysts (usually solid acids such as silica-alumina and zeolites), which promote a heterolytic (asymmetric) breakage of bonds yielding pairs of ions of opposite charges, usually a carbocation and the very unstable hydride anion. Carbon-localized free radicals and cations are both highly unstable and undergo processes of chain rearrangement, C–C scission in position beta (i.e., cracking) and intra- and intermolecular hydrogen transfer or hydride transfer. In both types of processes, the corresponding reactive intermediates (radicals, ions) are permanently regenerated, and thus they proceed by a self-propagating chain mechanism. The chain of reactions is eventually terminated by radical or ion recombination. Dragan and his colleague were the first to report about isomerization in alkanes. Isomerization and reformation are processes in which straight-chain alkanes are heated in the presence of a platinum catalyst. In isomerization, the alkanes become branched-chain isomers. In other words, it does not lose any carbons or hydrogens, keeping the same molecular weight. In reformation, the alkanes become cycloalkanes or aromatic hydrocarbons, giving off hydrogen as a by-product. Both of these processes raise the octane number of the substance. Butane is the most common alkane that is put under the process of isomerization, as it makes many branched alkanes with high octane numbers. Alkanes will react with steam in the presence of a nickel catalyst to give hydrogen. Alkanes can be chlorosulfonated and nitrated, although both reactions require special conditions. The fermentation of alkanes to carboxylic acids is of some technical importance. In the Reed reaction, sulfur dioxide, chlorine and light convert hydrocarbons to sulfonyl chlorides. Nucleophilic Abstraction can be used to separate an alkane from a metal. Alkyl groups can be transferred from one compound to another by transmetalation reactions. 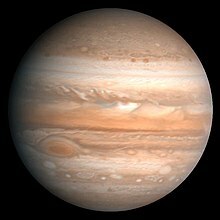 Alkanes form a small portion of the atmospheres of the outer gas planets such as Jupiter (0.1% methane, 2 ppm ethane), Saturn (0.2% methane, 5 ppm ethane), Uranus (1.99% methane, 2.5 ppm ethane) and Neptune (1.5% methane, 1.5 ppm ethane). Titan (1.6% methane), a satellite of Saturn, was examined by the Huygens probe, which indicated that Titan's atmosphere periodically rains liquid methane onto the moon's surface. Also on Titan the Cassini mission has imaged seasonal methane/ethane lakes near the polar regions of Titan. Methane and ethane have also been detected in the tail of the comet Hyakutake. Chemical analysis showed that the abundances of ethane and methane were roughly equal, which is thought to imply that its ices formed in interstellar space, away from the Sun, which would have evaporated these volatile molecules. Alkanes have also been detected in meteorites such as carbonaceous chondrites. Traces of methane gas (about 0.0002% or 1745 ppb) occur in the Earth's atmosphere, produced primarily by methanogenic microorganisms, such as Archaea in the gut of ruminants. These hydrocarbon deposits, collected in porous rocks trapped beneath impermeable cap rocks, comprise commercial oil fields. They have formed over millions of years and once exhausted cannot be readily replaced. The depletion of these hydrocarbons reserves is the basis for what is known as the energy crisis. Methane is also present in what is called biogas, produced by animals and decaying matter, which is a possible renewable energy source. Alkanes have a low solubility in water, so the content in the oceans is negligible; however, at high pressures and low temperatures (such as at the bottom of the oceans), methane can co-crystallize with water to form a solid methane clathrate (methane hydrate). Although this cannot be commercially exploited at the present time, the amount of combustible energy of the known methane clathrate fields exceeds the energy content of all the natural gas and oil deposits put together. Methane extracted from methane clathrate is, therefore, a candidate for future fuels. Acyclic alkanes occur in nature in various ways. Methanogenic archaea in the gut of this cow are responsible for some of the methane in Earth's atmosphere. Certain types of bacteria can metabolize alkanes: they prefer even-numbered carbon chains as they are easier to degrade than odd-numbered chains. Methanogens are also the producers of marsh gas in wetlands, and release about two billion tonnes of methane per year—the atmospheric content of this gas is produced nearly exclusively by them. The methane output of cattle and other herbivores, which can release 30 to 50 gallons per day, and of termites, is also due to methanogens. They also produce this simplest of all alkanes in the intestines of humans. Methanogenic archaea are, hence, at the end of the carbon cycle, with carbon being released back into the atmosphere after having been fixed by photosynthesis. It is probable that our current deposits of natural gas were formed in a similar way. Alkanes also play a role, if a minor role, in the biology of the three eukaryotic groups of organisms: fungi, plants and animals. Some specialized yeasts, e.g., Candida tropicale, Pichia sp., Rhodotorula sp., can use alkanes as a source of carbon or energy. The fungus Amorphotheca resinae prefers the longer-chain alkanes in aviation fuel, and can cause serious problems for aircraft in tropical regions. In plants, the solid long-chain alkanes are found in the plant cuticle and epicuticular wax of many species, but are only rarely major constituents. They protect the plant against water loss, prevent the leaching of important minerals by the rain, and protect against bacteria, fungi, and harmful insects. The carbon chains in plant alkanes are usually odd-numbered, between 27 and 33 carbon atoms in length and are made by the plants by decarboxylation of even-numbered fatty acids. The exact composition of the layer of wax is not only species-dependent but changes also with the season and such environmental factors as lighting conditions, temperature or humidity. More volatile short-chain alkanes are also produced by and found in plant tissues. The Jeffrey pine is noted for producing exceptionally high levels of n-heptane in its resin, for which reason its distillate was designated as the zero point for one octane rating. Floral scents have also long been known to contain volatile alkane components, and n-nonane is a significant component in the scent of some roses. Emission of gaseous and volatile alkanes such as ethane, pentane, and hexane by plants has also been documented at low levels, though they are not generally considered to be a major component of biogenic air pollution. Edible vegetable oils also typically contain small fractions of biogenic alkanes with a wide spectrum of carbon numbers, mainly 8 to 35, usually peaking in the low to upper 20s, with concentrations up to dozens of milligrams per kilogram (parts per million by weight) and sometimes over a hundred for the total alkane fraction. Alkanes are found in animal products, although they are less important than unsaturated hydrocarbons. One example is the shark liver oil, which is approximately 14% pristane (2,6,10,14-tetramethylpentadecane, C19H40). They are important as pheromones, chemical messenger materials, on which insects depend for communication. In some species, e.g. the support beetle Xylotrechus colonus, pentacosane (C25H52), 3-methylpentaicosane (C26H54) and 9-methylpentaicosane (C26H54) are transferred by body contact. With others like the tsetse fly Glossina morsitans morsitans, the pheromone contains the four alkanes 2-methylheptadecane (C18H38), 17,21-dimethylheptatriacontane (C39H80), 15,19-dimethylheptatriacontane (C39H80) and 15,19,23-trimethylheptatriacontane (C40H82), and acts by smell over longer distances. Waggle-dancing honey bees produce and release two alkanes, tricosane and pentacosane. One example, in which both plant and animal alkanes play a role, is the ecological relationship between the sand bee (Andrena nigroaenea) and the early spider orchid (Ophrys sphegodes); the latter is dependent for pollination on the former. Sand bees use pheromones in order to identify a mate; in the case of A. nigroaenea, the females emit a mixture of tricosane (C23H48), pentacosane (C25H52) and heptacosane (C27H56) in the ratio 3:3:1, and males are attracted by specifically this odor. The orchid takes advantage of this mating arrangement to get the male bee to collect and disseminate its pollen; parts of its flower not only resemble the appearance of sand bees but also produce large quantities of the three alkanes in the same ratio as female sand bees. As a result, numerous males are lured to the blooms and attempt to copulate with their imaginary partner: although this endeavor is not crowned with success for the bee, it allows the orchid to transfer its pollen, which will be dispersed after the departure of the frustrated male to different blooms. An oil refinery at Martinez, California. As stated earlier, the most important source of alkanes is natural gas and crude oil. Alkanes are separated in an oil refinery by fractional distillation and processed into many different products. The Fischer–Tropsch process is a method to synthesize liquid hydrocarbons, including alkanes, from carbon monoxide and hydrogen. This method is used to produce substitutes for petroleum distillates. Alkanes or alkyl groups can also be prepared directly from alkyl halides in the Corey–House–Posner–Whitesides reaction. The Barton–McCombie deoxygenation removes hydroxyl groups from alcohols e.g. The applications of alkanes depend on the number of carbon atoms. The first four alkanes are used mainly for heating and cooking purposes, and in some countries for electricity generation. Methane and ethane are the main components of natural gas; they are normally stored as gases under pressure. It is, however, easier to transport them as liquids: This requires both compression and cooling of the gas. Propane and butane are gases at atmospheric pressure that can be liquefied at fairly low pressures and are commonly known as liquified petroleum gas (LPG). Propane is used in propane gas burners and as a fuel for road vehicles, butane in space heaters and disposable cigarette lighters. Both are used as propellants in aerosol sprays. From pentane to octane the alkanes are highly volatile liquids. They are used as fuels in internal combustion engines, as they vaporize easily on entry into the combustion chamber without forming droplets, which would impair the uniformity of the combustion. Branched-chain alkanes are preferred as they are much less prone to premature ignition, which causes knocking, than their straight-chain homologues. This propensity to premature ignition is measured by the octane rating of the fuel, where 2,2,4-trimethylpentane (isooctane) has an arbitrary value of 100, and heptane has a value of zero. Apart from their use as fuels, the middle alkanes are also good solvents for nonpolar substances. Alkanes from nonane to, for instance, hexadecane (an alkane with sixteen carbon atoms) are liquids of higher viscosity, less and less suitable for use in gasoline. They form instead the major part of diesel and aviation fuel. Diesel fuels are characterized by their cetane number, cetane being an old name for hexadecane. However, the higher melting points of these alkanes can cause problems at low temperatures and in polar regions, where the fuel becomes too thick to flow correctly. Alkanes from hexadecane upwards form the most important components of fuel oil and lubricating oil. In the latter function, they work at the same time as anti-corrosive agents, as their hydrophobic nature means that water cannot reach the metal surface. Many solid alkanes find use as paraffin wax, for example, in candles. This should not be confused however with true wax, which consists primarily of esters. Alkanes with a chain length of approximately 35 or more carbon atoms are found in bitumen, used, for example, in road surfacing. However, the higher alkanes have little value and are usually split into lower alkanes by cracking. Some synthetic polymers such as polyethylene and polypropylene are alkanes with chains containing hundreds of thousands of carbon atoms. These materials are used in innumerable applications, and billions of kilograms of these materials are made and used each year. Alkanes are chemically very inert apolar molecules which are not very reactive as organic compounds. This inertness yields serious ecological issues if they are released into the environment. Due to their lack of functional groups and low water solubility, alkanes show poor bioavailability for microorganisms. There are, however, some microorganisms possessing the metabolic capacity to utilize n-alkanes as both carbon and energy sources. Some bacterial species are highly specialised in degrading alkanes; these are referred to as hydrocarbonoclastic bacteria. Methane is flammable, explosive and dangerous to inhale, because it is a colorless, odorless gas, special caution must be taken around methane. Ethane is also extremely flammable, dangerous to inhale and explosive. Both of these may cause suffocation. Similarly, propane is flammable and explosive. It may cause drowsiness or unconsciousness if inhaled. Butane has the same hazards to consider as propane. Alkanes also pose a threat to the environment. Branched alkanes have a lower biodegradability than unbranched alkanes. However, methane is ranked as the most dangerous greenhouse gas. Although the amount of methane in the atmosphere is low, it does pose a threat to the environment. Wikimedia Commons has media related to Alkane. Look up alkane in Wiktionary, the free dictionary. ^ "Alkanes". 28 November 2016. ^ Arora, A. (2006). Hydrocarbons (Alkanes, Alkenes And Alkynes). Discovery Publishing House Pvt. Limited. ISBN 9788183561426. ^ IUPAC, Commission on Nomenclature of Organic Chemistry (1993). "R-2.2.1: Hydrocarbons". A Guide to IUPAC Nomenclature of Organic Compounds (Recommendations 1993). Blackwell Scientific. ISBN 978-0-632-03488-8. Retrieved 12 February 2007. ^ Thus, the ending "-diene" is applied in some cases where von Hofmann had "-ine"
^ a b William Reusch. "Nomenclature – Alkanes". Virtual Textbook of Organic Chemistry. Archived from the original on 21 May 2016. Retrieved 5 April 2007. ^ William Reusch. "Examples of the IUPAC Rules in Practice". Virtual Textbook of Organic Chemistry. Archived from the original on 21 May 2016. Retrieved 5 April 2007. ^ "IUPAC Rules". www.chem.uiuc.edu. Retrieved 13 August 2018. ^ "13. Hydrocarbons | Textbooks". textbook.s-anand.net. Archived from the original on 8 May 2011. Retrieved 3 October 2014. ^ a b c d e f R. T. Morrison; R. N. Boyd (1992). Organic Chemistry (6th ed.). New Jersey: Prentice Hall. ISBN 978-0-13-643669-0. ^ "Physical Properties of Cycloalkanes". Chemistry LibreTexts. 29 November 2015. Archived from the original on 2 February 2018. Retrieved 2 February 2018. ^ Boese R, Weiss HC, Blaser D (1999). "The melting point alternation in the short-chain n-alkanes: Single-crystal X-ray analyses of propane at 30 K and of n-butane to n-nonane at 90 K". Angew Chem Int Ed. 38: 988–992. doi:10.1002/(SICI)1521-3773(19990401)38:7<988::AID-ANIE988>3.3.CO;2-S.
^ a b c Asinger, Friedrich (1967). Paraffins; Chemistry and Technology. Oxford: Pergamon Press. ^ Emily Lakdawalla. "Titan: Arizona in an Icebox?". Archived from the original on 6 April 2008. Retrieved 21 January 2004. ^ Mumma, M.J.; Disanti, M.A. ; dello Russo, N.; Fomenkova, M.; Magee-Sauer, K.; Kaminski, C.D. ; D.X., Xie (1996). "Detection of Abundant Ethane and Methane, Along with Carbon Monoxide and Water, in Comet C/1996 B2 Hyakutake: Evidence for Interstellar Origin". Science. 272 (5266): 1310–4. Bibcode:1996Sci...272.1310M. doi:10.1126/science.272.5266.1310. PMID 8650540. ^ Janssen, P. H.; Kirs, M. (2008). "Structure of the Archaeal Community of the Rumen". Appl Environ Microbiol. 74 (12): 3619–3625. doi:10.1128/AEM.02812-07. PMC 2446570. PMID 18424540. ^ "Metabolism of Alkanes and Fatty Acids — eQuilibrator 0.2 beta documentation". equilibrator.weizmann.ac.il. Retrieved 11 April 2018. ^ "Marsh gas - an overview | ScienceDirect Topics". www.sciencedirect.com. Retrieved 11 April 2018. ^ TodayIFoundOut.com, Matt Blitz -. "Do Cow Farts Actually Contribute to Global Warming?". Gizmodo. Retrieved 11 April 2018. ^ Buczkowski, Grzegorz; Bertelsmeier, Cleo (15 January 2017). "Invasive termites in a changing climate: A global perspective". Ecology and Evolution. 7 (3): 974–985. doi:10.1002/ece3.2674. PMC 5288252. PMID 28168033. ^ Society, National Geographic (24 July 2012). "natural gas". National Geographic Society. Retrieved 11 April 2018. ^ Hendey, N. I. (1964). "Some observations on Cladosporium resinae as a fuel contaminant and its possible role in the corrosion of aluminium alloy fuel tanks". Transactions of the British Mycological Society. 47 (7): 467–475. doi:10.1016/s0007-1536(64)80024-3. ^ Kim, HyunJung; Kim, NamSun; Lee, DongSun (2000). "Determination of floral fragrances of Rosa hybrida using solid-phase trapping-solvent extraction and gas chromatography–mass spectrometry". Journal of Chromatography A. 902 (2): 389–404. doi:10.1016/S0021-9673(00)00863-3. ^ Kesselmeier, J.; Staudt, N. (1999). "Biogenic Volatile Organic Compounds (VOC): An Overview on Emission, Physiology and Ecology" (PDF). Journal of Atmospheric Chemistry. 33: 22–38. doi:10.1023/A:1006127516791. Archived from the original (PDF) on 13 March 2013. ^ Moreda, W.; Perez-Camino, M. C.; Cert, A. (2001). "Gas and liquid chromatography of hydrocarbons in edible vegetable oils". Journal of Chromatography A. 936 (1–2): 159–171. doi:10.1016/s0021-9673(01)01222-5. ^ Thom; et al. (21 August 2007). "The Scent of the Waggle Dance". PLoS Biology. 5 (9): e228. doi:10.1371/journal.pbio.0050228. PMC 1994260. PMID 17713987. ^ Barton, D. H. R.; McCombie, S. W. (1975). "A new method for the deoxygenation of secondary alcohols". J. Chem. Soc., Perkin Trans. 1 (16): 1574–1585. doi:10.1039/P19750001574. ^ Crich, David; Quintero, Leticia (1989). "Radical chemistry associated with the thiocarbonyl group". Chem. Rev. 89 (7): 1413–1432. doi:10.1021/cr00097a001. ^ Buchanan, J. G. St. C.; Woodgate, P. D. Quart. Rev. 1969, 23, 522, (Review). ^ Vedejs, E. Org. React. 1975, 22, 401, (Review). ^ Yamamura, S.; Nishiyama, S. Compr. Org. Synth. 1991, 8, 309–313, (Review). ^ Singh, S. N.; Kumari, B.; Mishra, Shweta (2012). "Microbial Degradation of Alkanes". In Singh, Shree Nath (ed.). Microbial Degradation of Xenobiotics. Springer. pp. 439–469. doi:10.1007/978-3-642-23789-8_17. ISBN 978-3-642-23788-1. ^ Berthe-Corti, L.; Fetzner, S. (1 July 2002). "Bacterial Metabolism of n-Alkanes and Ammonia under Oxic, Suboxic and Anoxic Conditions". Acta Biotechnologica. 22 (3–4): 299–336. doi:10.1002/1521-3846(200207)22:3/4<299::AID-ABIO299>3.0.CO;2-F. ISSN 1521-3846. ^ Dashti, Narjes; Ali, Nedaa; Eliyas, Mohamed; Khanafer, Majida; Sorkhoh, Naser A.; Radwan, Samir S. (March 2015). "Most Hydrocarbonoclastic Bacteria in the Total Environment are Diazotrophic, which Highlights Their Value in the Bioremediation of Hydrocarbon Contaminants". Microbes and Environments. 30 (1): 70–75. doi:10.1264/jsme2.ME14090. ISSN 1342-6311. PMC 4356466. PMID 25740314. ^ a b "CDC - METHANE - International Chemical Safety Cards - NIOSH". www.cdc.gov. Retrieved 19 September 2017. ^ a b "CDC - ETHANE - International Chemical Safety Cards - NIOSH". www.cdc.gov. Retrieved 19 September 2017. ^ a b "CDC - PROPANE - International Chemical Safety Cards - NIOSH". www.cdc.gov. Retrieved 19 September 2017. ^ "CDC - BUTANE - International Chemical Safety Cards - NIOSH". www.cdc.gov. Retrieved 19 September 2017. ^ Woodside, Gayle; Kocurek, Dianna (26 May 1997). Environmental, Safety, and Health Engineering. John Wiley & Sons. ISBN 9780471109327. ^ a b "Pollutant Fact Sheet". apps.sepa.org.uk. Retrieved 19 September 2017.